When we wake up every morning at the Sloth Sanctuary, we can never predict what the day is going to bring. Friday the 1st of November was certainly no exception. I had just emerged from the jungle after monitoring Madonna when we noticed a MINAET (environmental ministry) vehicle pull into the sanctuary. Our hearts sank. This could only mean one thing ... a new sloth emergency. 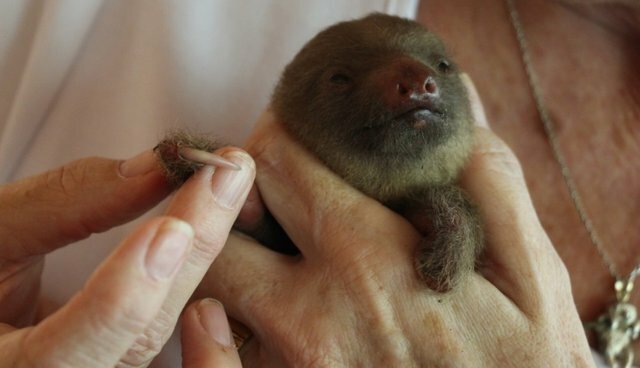 The MINAET representative pulled out a small shoebox from the back of the car and opened it up to reveal a tiny, chocolate brown two-fingered baby sloth. He had apparently been found alone on the ground by a Costa Rican family. They could see his mother up a nearby tree, but she was not interested in retrieving him. Wanting to help the little baby, the family took him into their home and tried feeding him some milk. They didn't know it at the time, but this was the worst thing they could possibly have done. Sloths cannot tolerate the large fat molecules found in cows milk. Thankfully we don't think he drank too much of it, but only time will tell. The family kept the baby in their home for three days before deciding that he really needed expert help. After a quick medical examination by the sanctuary veterinarian, it didn't take us long to discover why his mother had rejected him. 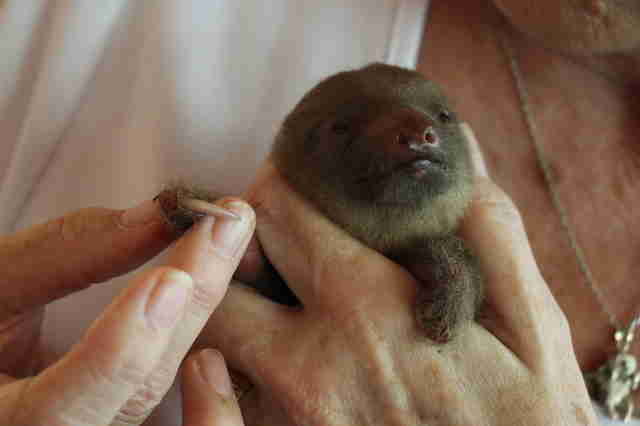 This little baby sloth only has one finger on each hand! In fact, he has several birth deformities, including badly shaped toes, limited movement in his tiny hands, and no ears. We named this special little sloth Koki. Thankfully, despite the physical deformities, everything else seems to be working fine and he has the appetite of a champion! After guzzling down some goats milk, he settled into his new incubator to warm up and have his first snooze. 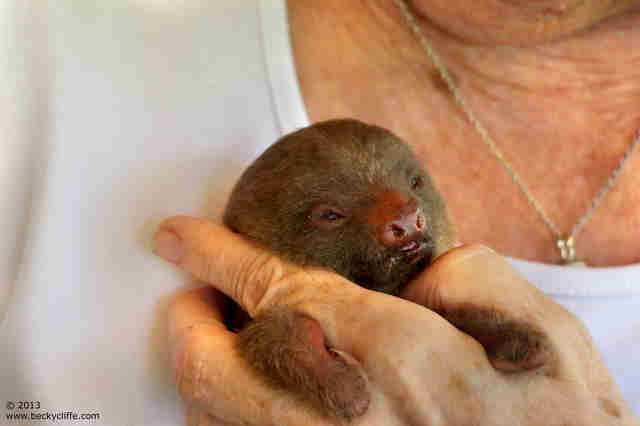 The arrival of genetically deformed baby sloths has sadly become a worrying trend over the past few years. First to arrive was Oona, a sweet Choloepus with just one finger on each hand. She thrived and is now a healthy adult living a life of luxury here at the sanctuary. Last year we were all shocked by the arrival of BooBoo, a beautiful baby with shrunken arms, one finger, fused legs, and bulging eyes. 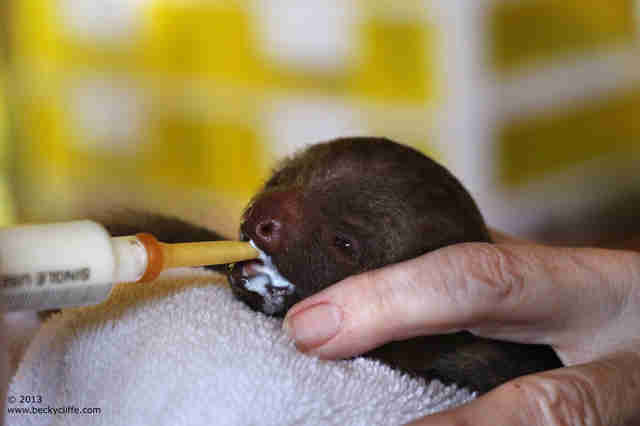 Although this tough little sloth seemed to adapt well at first, he slowly deteriorated and we lost him several months later. A necropsy sadly identified numerous internal deformities that made it impossible for him to survive. In March this year we received Goldilocks: another tiny newborn baby with deformities to her hands and jaw. She too lost her battle within a few weeks of arriving at the sanctuary. And now we have Koki. Fingers crossed his problems are only external, and with plenty of love and attention we all hope that he will be just fine. Why these little babies are being born with such severe deformities is a mystery. The rampant use of toxic pesticides on the fruit plantations covering Costa Rica is likely to be a huge factor. These pesticides are being ruthlessly sprayed across the whole rainforest, covering the leaves and slowly making their way down the food chain. If you need any motivation to buy organic produce, let little Koki be it!